This swim is a big deal for me – I’ll be swimming round all the tricky headlands and rocky outcrops, through Caldey Sound, and passed military firing zones. 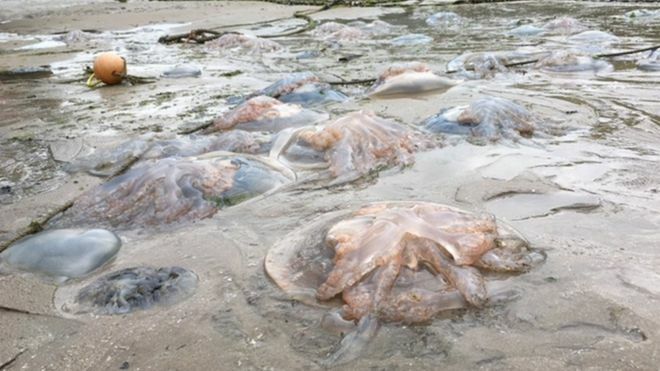 And… the Pembrokeshire coast at the moment is full of jellyfish! Start date: 1st August, weather permitting. Amroth, Wiseman’s Bridge, Saundersfoot, Monkstone Beach, Waterwynch Bay, Tenby, Penally, Lydstep Haven, Skrinkle Haven, Presipe, Manorbier, Swanlake Bay, Freshwater East and back to Swanlake Bay (one of Rache’s favourite beaches). Dan will kayak alongside me for support. He’s planning to catch fish on the way, so we can cook up fresh bass on the fire in the evenings!